In 2008 my mom decided she couldn't cope with the family house any more - time to sell it and move into an apartment. She'd given her best shot at keeping it clean and tidying it up after dad passed away, but five years later it was basically unchanged. A million objects, each loaded with sentimental attachments; she couldn't throw them out. It was all she could do to walk away. Dad and mom had both lived through extremes of poverty, and saved everything that showed a possibility of being useful. Anything cheap was good; anything expensive was too expensive; most of what they accumulated was useless, while they did without functional things that would have made their lives easier. To make matters worse, dad had a flea market stall and could talk himself into buying anything on the pretext that it might be salable someday, with just a bit of repair. To me it looked like a limitless sea of junk, but worse, a field sown with little emotional landmines. It took three months, a scrap dealer, seven dumpsters, and the rapacious avariciousness of several flea market vendors to empty the house (they thought they were screwing me over; I felt like I was giving free booze to an alcoholic; I wish I could apologise directly to their children). To try to make sense of the assault of emotions, I did what any artist might do: I aestheticised the experience. Thousands of photos, then and over the course of the next few years. 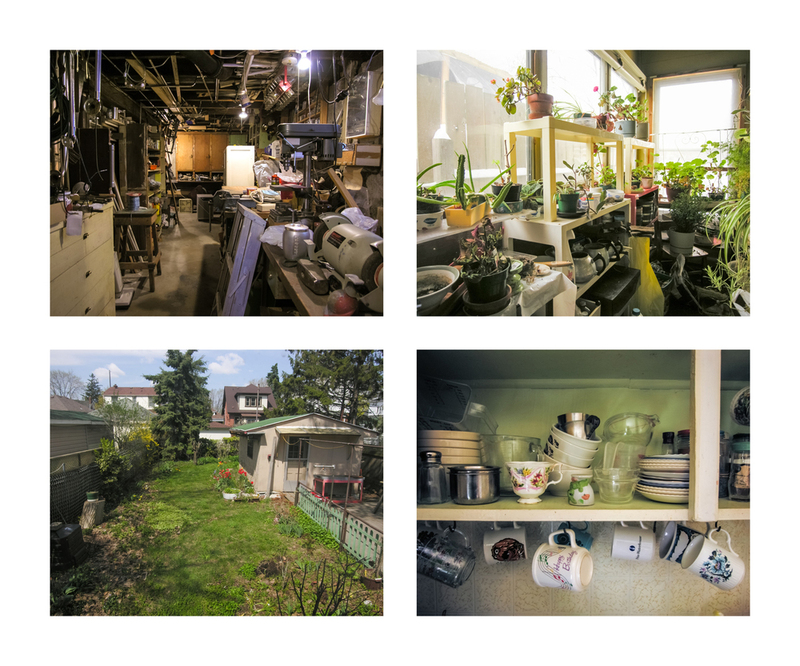 From the documentation of the house-in-process, through the "catalogue" photos, and the Hēphaistos/Śivas, you can see me coming to terms with the chaos. Standing back and looking at the objects themselves, there is a lot to say about industrial design and manufacturing history; another way they had a hook in me. I made up an important ritual. Pick up an object. Who or what does it remind you of? Now: will you forget that person if you get rid of this object? Of course not. Still can't let go of it? OK, take a photo, and let the object go. It was a while before I realized that What does it remind you of? has always been one of my most useful ways of approaching art, too. Video: Take It Away (Pulse Version), a song by rabbitfish. Still photography & montage by Bill Pusztai, video by rabbitfish and Bill Pusztai, production by rabbitfish. 2012, Canada, 4:07. Attachments. Metal box used for sewing machine parts. 2009, 20" × 12", artist's proof, archival giclée print (Epson Ultrachrome HDR inks on Epson Premium Luster Photo Paper), $197. Pamper cat food tin used to catch plumbing drips, 7UP can used as a wire spool, Cummins jigsaw, dad's kit for making tea and coffee on fishing trips. 2008, 20" × 24", artist's proof, archival giclée print (Epson Ultrachrome HDR inks on Epson Premium Luster Photo Paper), $379. My teddy bear, jar of lead letters, tin used for teabags, cod liver oil. Dad's workshop, mom's plant room, the back yard, kitchen cabinet. Living room half-emptied, my bedroom, view of the neighbours' house, kitchen clock. Baby food jar / springs, Colmoloy Sprayweld tin | 3/8" and 7/16" metal washers, Hungarian Mixed Salad jar | machine screws, BiWay Deluxe Nuts tin | carriage bolts & wingnuts. 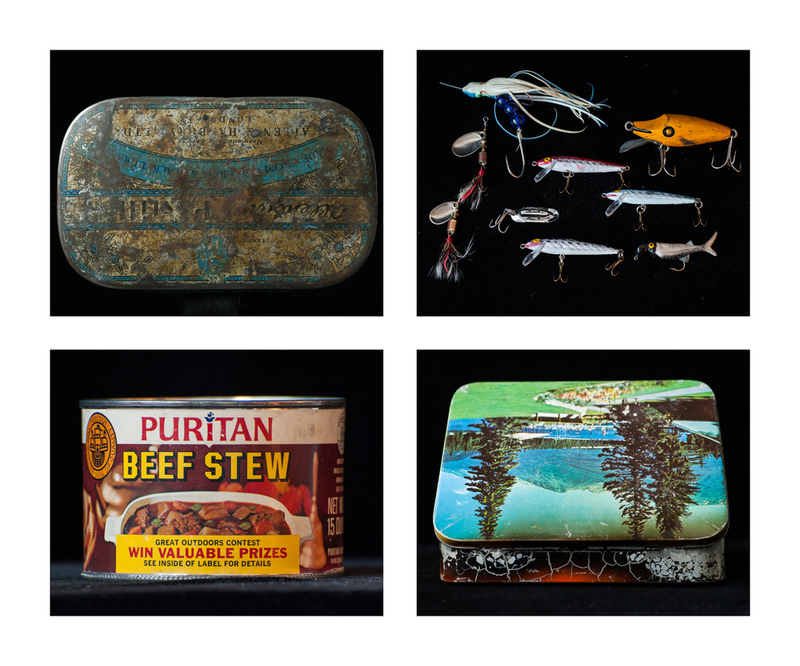 Cough drop tin used for fishing sinkers, fishing lures, Puritan Stew tin used for paint, candy tin with hinges welded on used for taps and dies. Four bottles: my dad worked in a bottle factory, and when a shop foreman retired after many years' work there, a bottle was made with his face on it and a brief history of his time at the company on the back. Hēphaistos in the style of Śiva.